This week, we welcomed a new pet into our family. Meet Charlie, our new CleverKeet. Luckily for me, Charlie isn't a 'real' pet although he does make enough noise like a real one. He keeps the kids happy without having to be fed or cleaned or groomed which is great. This Little Live Pet Cleverkeet from Character Options is an all singing, all dancing, all talking, interactive pet bird! 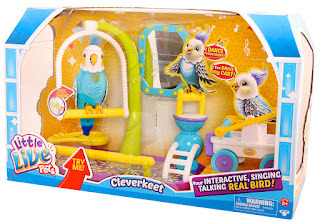 Cleverkeet is just like a real bird only smarter. He talks, sings, dances and swings. He responds to your voice and you can teach him to speak. You can even ask him questions and he will respond to you. Make sure you feed him when he's hungry and play music to watch him dance along to the beat. You can sit and swing him on the perch or you can even detach the perch and carry him around! 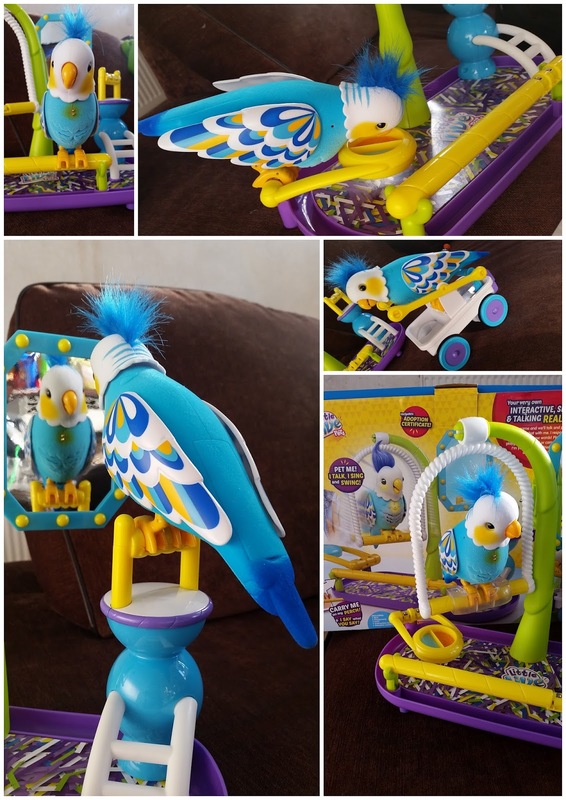 This Little Live Pet Cleverkeet set contains; A Clever Keet bird, a playground, a cart, an instruction booklet and an adoption certificate and is aimed at children aged 5 years and over. We've been having a play with one this week and have to say it's much more entertaining than we had thought it would be. Our Charlie, which is what we've named our new pet talks a lot and sure likes to dance. If he's not dancing, he's talking and if he's not talking, he's dancing. There's several areas of his playground that have interactive points on so you can move him around to activate different motions, phrases and actions. At his food bowls he will move back and forth in a feeding motion so it really looks as if he's eating his food. At the mirror he plays music and dances along in his own funky way. On his cart he moves in a rocking motion allowing him to push himself along in it and on his swing he happily swings backwards and forwards. He sure does like his playground habitat. Ryan, my youngest (aged 5) loves him. He's been really intrigued by the things that he says. He comes out with the most random phrases sometimes but that's what make it so funny. Ryan likes it when he dances along to music and loves watching him swing. Our Little Live Pet Cleverkeet Charlie has settled in really well over the past week. I think Ryan has taken quite a liking to him and hopefully they will become the best of friends. 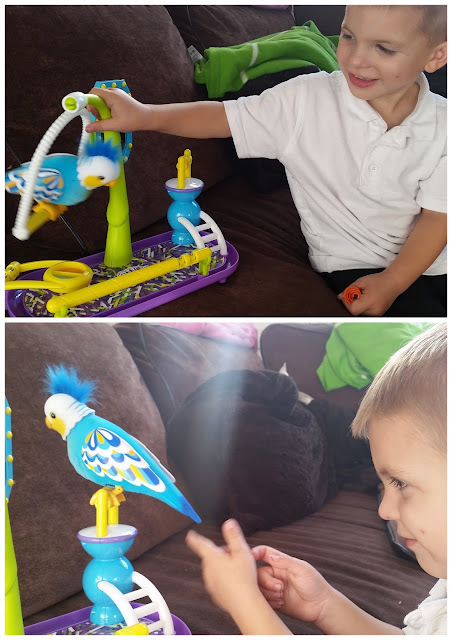 Charlie our CleverKeet is fun, witty and very entertaining and unlike a real bird, we don't have to worry about feeding him or cleaning up after him. And he won't fly away if leave the windows open - Not that a real one of ours has, we've never owned a real bird. Disclosure: We received our sample in return for an honest review. All the opinions expressed within this review are 100% honest and entirely my own.